Conversations like this one play out every day, and your moving company can be the beneficiary of referrals from former and current customers who appreciate your services. But what can you do to encourage referrals? We’ve put this post together to give you some suggestions. The most enduring and impactful thing you can do to encourage referrals is to provide extraordinary customer service. In the moving industry, customer service is what makes you stand out from the crowd. Your employees get a very intimate view of people’s lives--they actually handle their stuff and interact with them when they’re feeling tired and vulnerable. If your business provides this caliber of customer service on a routine basis, you’ll have plenty of happy customers on your hands. While your customers are feeling happy and thinking about your business, ask them for reviews and testimonials. These testimonials can be used in a variety of ways, and they’re even more effective than much of the content you produce for your own marketing materials. The reason referrals are so effective is that they’re provided by people who have used your services. People tend to trust former and existing customers more than they trust the business, at least at first. So turn your happy customers into marketers for you. Make it easy for them to leave reviews, either on your website or social media, and ask for permission to use the reviews in your marketing. With all of these great reviews, you’ll want to spread them as far and as wide as possible. Social media is the perfect vehicle for sharing, so encourage your happy customers to share their referrals on Twitter, Facebook, Instagram, LinkedIn, and other platforms. You can even offer discounts or added benefits for people who share your social media posts or write referrals. For example, you could offer customers free boxes or other moving supplies for referring their friends or writing a testimonial on social media. One of the best ways to get referrals to your website is to use a referral program page as part of your website navigation. A referral page allows current and past clients to refer their friends and family to your company moving and storage services and receive a bounty for doing that. 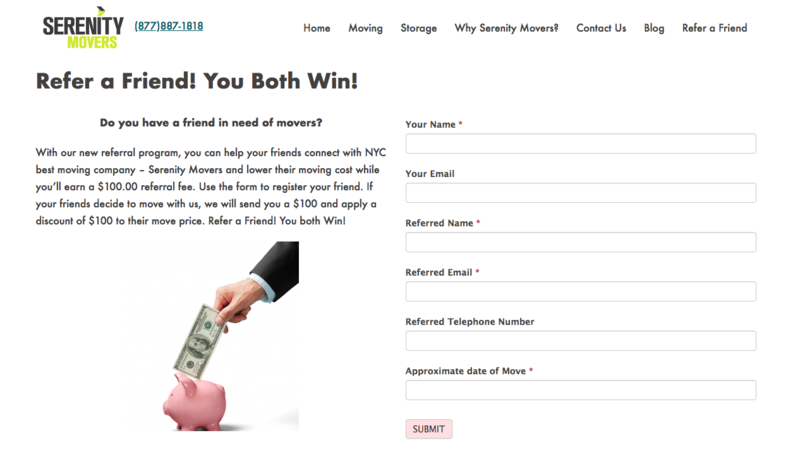 We found out that this is the least expensive way to receive targeted prospects for a moving company in the NYC area. Here is an example of a simple, yet successful referral page we created for one of our clients. The page allows clients to easily refer their friends and receive cash from the moving company. Local influencers can be powerful marketers, but you’ll want to be careful about how you use them. If you know an influential blogger or local personality, ask if you can help them with a move in exchange for a referral. Consider getting video referrals from influencers. Buzzsumo’s research from 2017 on Facebook’s 880 million posts showed that video posts have the highest levels of engagement--twice the level of engagement of other types of posts. Don’t miss out on this kind of engagement. Do what you can to get video referrals from influencers. At the end of a long move, your workers want nothing more than to go home and put their feet up. Train them, however, to ask for referrals before they say good-bye to your clients. Clients have the inside scoop on which of their friends and neighbors are planning to move within the next year. So it’s important that every customer is encouraged to refer their friends. Make it easy for your staff to promote your referral program by providing business cards, coupons, or flyers to give to their friends. You can also collect client email addresses and send them information about how to refer their friends. As you make referrals a priority for your moving business, you’ll gain valuable new customers and increase your visibility in the community. For more information about digital marketing, or to start creating a formal referral program of your own, get in touch with us at Park Slope Softworks, your Brooklyn digital marketing agency. Want more ideas on marketing your moving company? Check out our White paper on how to get people to take action on your website.